Sony launched some great phones this year but the company failed to impress with its phones as we hoped to see a new design, at least an 18:9 display (if not a bezel-less display) and dual cameras etc. 2017 is ending in a week and we are all set to witness what Sony is preparing for next year. There have been some leaks previously that hint at a new design language for 2018’s Sony flagships, but the details haven’t been confirmed yet. 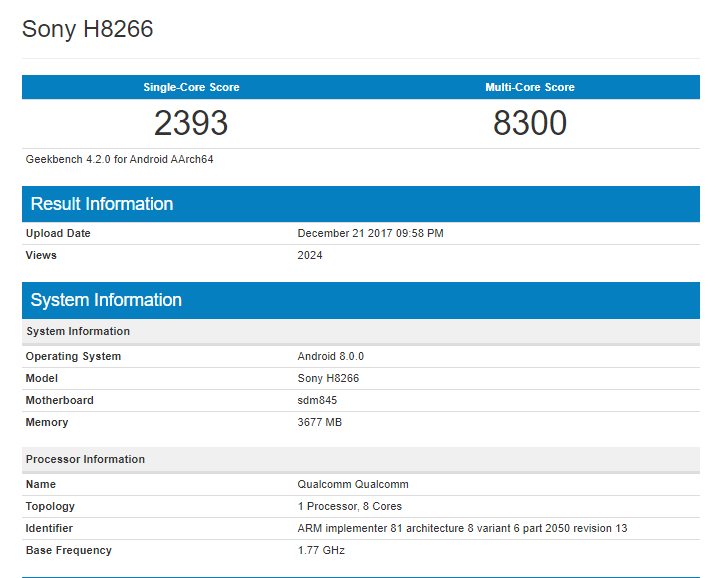 Today, however, an upcoming Sony smartphone was spotted on Geekbench that shows that Sony will be among the first companies to launch Snapdragon 845 powered smartphone(s). Listed with the model number Sony H8266, the phone is powered by an octa-core Snapdragon 845 processor and has 4GB of RAM. Android Oreo runs out of the box. Talking about the benchmark scores, the phone scored 2393 on single core and 8300 on Multi-Core. The scores are pretty similar to those of the Galaxy S9+ which was spotted on Geekbench a few days back. So, looks like the phone is going to be very powerful regarding the performance. Do you think Sony will finally launch phones with an updated design next year? What do you want to see from Sony’s 2018’s flagships? Do let us know via the comments section.